A paver driveway, properly installed, will last much longer than either asphalt or concrete. How much do paver driveways cost, and how do they hold up? Hopefully this article will tell you everything you need to know. Paver patios and paver driveways have nearly the same installation process. The difference is that a paver patio requires a minimum of 4″ of compacted base material, and a driveway requires at least 9″ of compacted base, to handle the weight of cars and trucks. For patios, we use 6″ of compacted base, and for driveways, we use a full 12″ of compacted base. We’ve done raised patios with as much as four feet of base underneath. You could drive a tank on those! Be sure to visit our Paver Driveways Project Gallery to see more photos. 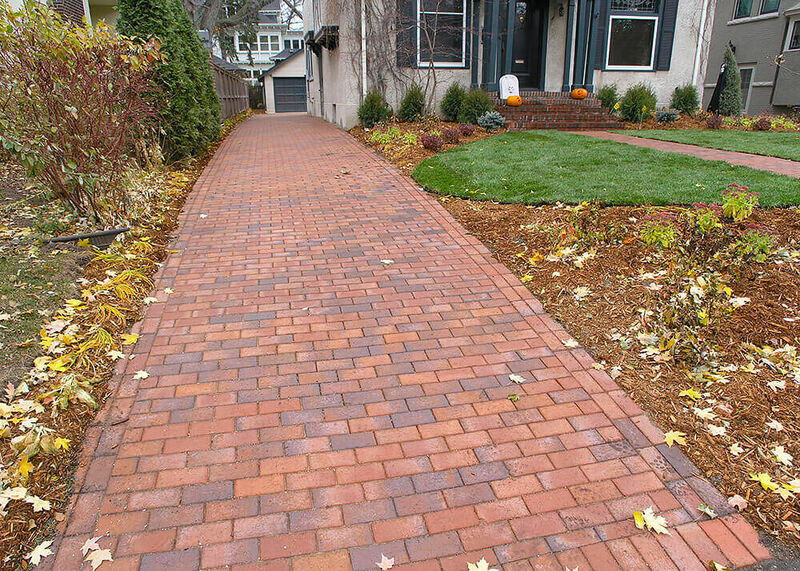 A paver driveway, properly installed, will last much longer than either asphalt or concrete. 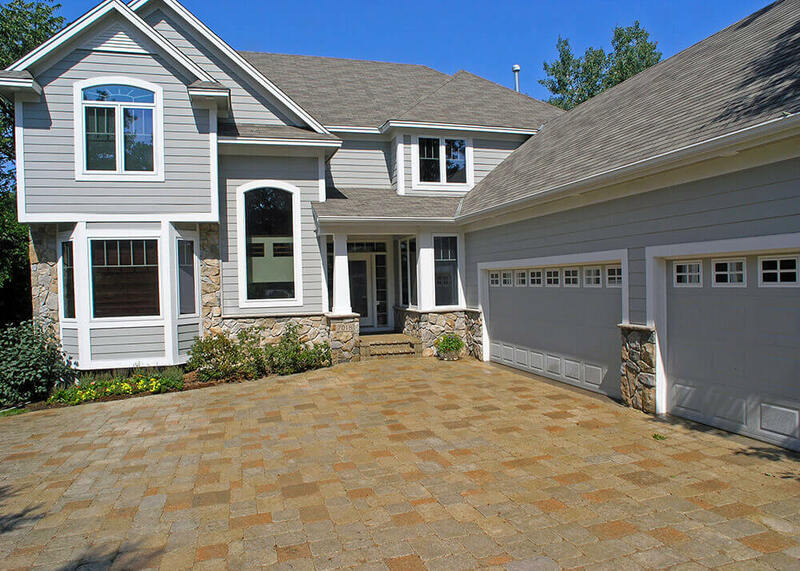 We install paver driveways on a full 12″ of compacted base material, ensuring that the driveway will never move. The pavers, either clay or concrete, are oven-cured to ~10,000 PSI (three times the strength of poured concrete) and can withstand much more pressure than a car or truck would ever put on them. So both the base and the surface are solid and durable. Once a paver driveway is installed, it requires no further technical maintenance. Another great benefit to pavers is that any paver or group of pavers can always be removed and replaced, if necessary. In a disaster where you spill a large amount of something on your paver driveway and can’t clean it off, it’s actually quick and easy to remove and replace the damaged pavers. Clay pavers often have the same texture on the top and bottom, so they can simply be removed, turned upside-down, and replaced. Pavers have been used for thousands of years in Europe and around the world to pave roads. They are still widely used today. Hedberg Landscape Supply has pavers installed where 15-ton dump trucks drive over them every day. You can use your snowblower or have a snowplow company plow a paver driveway in the winter. They won’t hurt it. Concrete is totally inflexible. It can not bend with the freeze/thaw cycle, so every winter it develops new cracks. It is installed on little (if any) compacted base material, so it received the full brunt of the frost every year. The surface of poured concrete is durable, but if you spill something uncleanable, you are stuck with it. There’s no possible way to remove and replace a chunk without leaving a very obvious patch. Stamped concrete has the same drawbacks as regular concrete, and is more expensive than pavers. Stamped concrete looks good until the cracking starts, and no amount of rebar will stop it. Concrete is too inflexible to stand our winters. Asphalt is a cheap product, designed to be inexpensive to install and repair. Asphalt is installed on 4-6″ of compacted base material, which prevents movement. But it’s not really enough base to be totally stable. 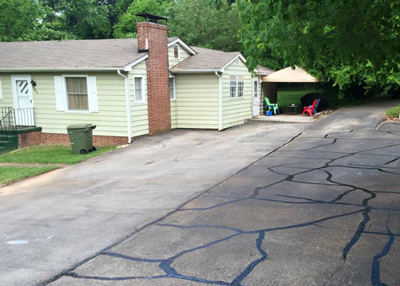 Asphalt is soft and easily damaged, particularly during summer heat waves. It needs cracks and holes filled and to be resealed every couple of years to keep looking nice. Oil leaks can eat through asphalt, surprisingly. You save money up-front on the installation of an asphalt driveway, but if you want it to stay looking nice, you have to spend money on it most every year. I personally think that asphalt looks pretty nice when it’s new, but give it 5 years of patching and sealcoating, and suddenly the paver driveway next door looks about 100 times better. The price range for asphalt is $5.00-9.00/SF, depending on the experience of the contractor, the quality of asphalt they’re using, and size of the job. Paver Driveways: No matter what size driveway or what paver you choose, it’s unlikely you’ll pay less than $12/Square Foot or more than $18/Square Foot. This price includes tearout, and 12″ of compacted base material under the pavers. For new construction homes, which have no driveway yet, it’s possible to get under $12/SF. Call for pricing. We use huge, heavy compactors to prepare driveways. 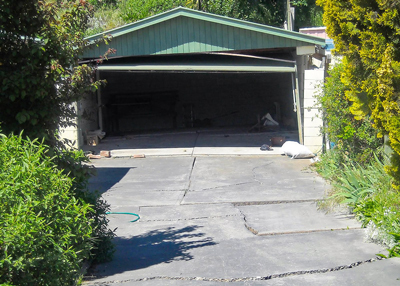 Be very careful if you get a really cheap driveway quote. There’s no way to skimp on any part of a driveway except the base and compaction – and that’s the most important part. We provide you with a 2-year craftsmanship warranty. In the extremely rare case where a few pavers move, it will happen over the first winter. It’s an easy fix to remove them, add some base material, and replace them. Then you have a full second year of warranty so you can feel safe in your investment. We’re here for you. Contact us for a free estimate!